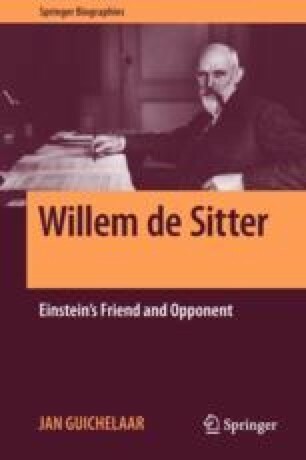 De Sitter was obsessed by gravitation during his whole working life. Till Einstein there was only Newton’s law of gravitation, giving the gravitational force Fg of two masses m1 and m2 on each other: Fg = Gm1m2/r2, in which r is the mutual distance and G the gravitational constant (a mass twice as big gives twice the force, a double distance gives a quarter of the force). With the help of the tools provided by the celestial mechanics De Sitter worked on the heliometer measurements of Gill, in order to deduce from them data of Jupiter’s moons. More and more I find myself on the path of pure theoretical celestial mechanics.